1- Combine all dressing ingredients and set aside. 3- Heat olive oil in a sauté pan, until it is almost smoking. Place shrimp in the hot oil quickly, and sauté immediately to prevent the oil from splattering up. 4- Sauté shrimp until it is no longer translucent and pinkish/orange in color. Add a pinch of salt and remove from heat onto a plate. Let cool about 2 minutes. 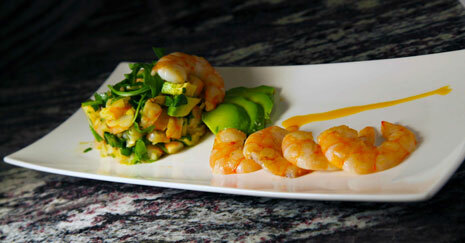 5- Meanwhile, spread the salad on a plate, lay shrimp on top of salad and drizzle with Dressing mixture and fresh lime juice.